Wisdom of the Hands: how to avoid whacking your thumb. how to avoid whacking your thumb. A friend of mine showed up at the gym with his thumb bandaged having been hit by a hammer hard enough that he might lose his nail. That can happen to anyone. My illustration tells how to avoid it. The captions read "Hold nail at point, hammer miss smashes thumb." 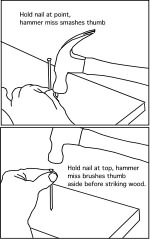 "Hold nail at the top, hammer miss brushes thumb aside before striking wood." In the one case, depending on how hard the thumb is whacked, the nail could be bruised or bloodied and left in great pain. In the other case, no harm is done. Please heed this simple advice. The interesting thing is that out of fear we would typically try to keep our fingers away from where the hammer will strike, thus putting them at greater risk. I have been going through mountains of information I've compiled about woodworking with kids, trying to distill it to an essence that will help parents and teachers feel confident allowing children to create beautiful and lasting things from real wood. Today in the wood shop at the Clear Spring School, my students and I will be cleaning, organizing shop, and finishing projects that must not be left over the summer months. One day I talked to my father about the decline in sloyd in the Danish school system. He said that he always felt that it was important to make something that was useful at home for the pupils. Stuff like a small cutting board or a step stool etc. I can see an idea in that approach, but today sadly a lot of people have got very streamlined homes when it comes to interior decorations and choice of kitchen appliances. So it is my impression that often the products that children make are never used or displayed at home, but received, and then tucked away in a drawer. If we want our children to feel proud of what they have made, then we as parents need to show them that we really appreciate and use the things they make. It could be something as simple as a key ring out of wood that has been decorated, but seeing your parent using it every day will install confidence and pride in the child. Because he/she will know that they themselves have made it. Making real things for real use. I often see that designed homes and flats and cars and bikes and bags and clothes and toys… of others where there is only few room for – let’s say – improvement. I am fascinated by the perfect appearance of industrial products. But I am – when it comes to connect with other people – much more fascinated how friends and strangers manage to make something that comes from their mind and hands. And then the term “perfect appearance” is quite relative. The connection to the maker and his/her background is much more fascinating. Sometimes I ask my children for a "contract work". Bathroom towels: often the original fabric-made cord is worn out or too narrow for our installed hooks. So I ask the girls to braid a new one. Later one of us sews it to the towel. We can observe how our product proves itself in everyday use. We've got industrial made cutting boards. They are worn out. I planed them - with no charming effect. Then my daughter asked one birthday, which wood she could decorate with her new set of poker work items... You guess what. Actually that story begins on a sunny morning when one of them grabbed a magnifier to let the sun show their concentrated power; back then we made some dots and flowers and thoughtless patterns on wood - these memories often pop-up when the girls use their cutting boards in the daily use – and sometimes lead to new ideas and actions. Another contract work on a regular basis is: “Can you sharpen the knife, please? !” My 5th grade class daughter knows to handle the small kitchen knives on the sharpening stones and likes to show her expertise to her two years younger sister. Well, the knives are often sharper than before their effort, but not always. And that is what effects the easiness of cutting veggies, cheese, bread… They realize what happens and often thrilled by their improvements when “their” knife runs through a tomato with ease – and not with squeeze. I hope it will have a lasting effect for their later life; let’s see. In the nowadays live it brings joy, happiness and makes sense in our daily live. My wife recently retired and put into safe keeping, the wooden key ring my daughter had made in my shop in first or second grade. It is meaningful for kids to see that what they have done has value in the eyes of parents and friends. The key ring is made of maple in the form of a star, irregularly drawn, and then illustrated with markers and obviously the work of a child. And it has been loved and used and become worn. It fascinates me that as all of the things in our homes become more and more perfectly manufactured, the kids in wood shop are happy with rough edges and things that are more obviously hand made. So, why is that? Yesterday my middle school kids finished bird houses they’ve been making. They were rather roughly made, but the students noted, “the birds won’t mind.” From an adult view, the birdhouses are evidence of learning. We grow and learn by doing real things. the celebration of the child. clamping miter box and saw. A centering vise for wheels and pens.